Although you’ll still be able to make some great Vietnamese food even without access to a lot of special (read: hard to find) herbs, I wanted to include a quick primer for those of you with access to a good Vietnamese or Asian market in case you’d like to do some experimenting. 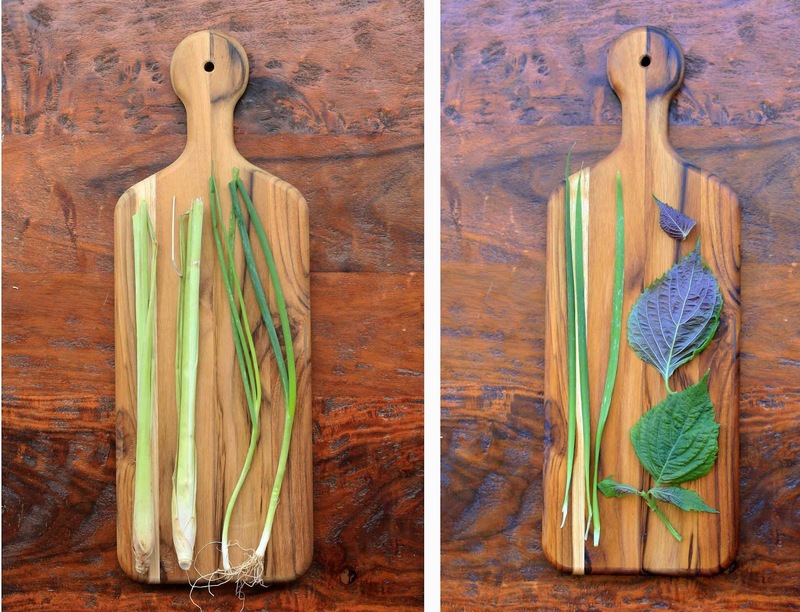 In the photos below I placed all of the herbs on the same cutting board to give you a sense of scale. There are also a couple of herbs that I’ve yet to get a good photograph of (I get to the market too late and they’ve already sold out! ), so I’ll be sure to try to update as soon as possible with photos of wild betel leaf and sorrel. Cilantro (also called coriander leaves and Chinese parsley): unless you’ve been living under a rock, you probably already know about cilantro and have determined out whether you’re in the love or hate camp. I love it’s bright, citrusy flavor but it can taste soapy to some unlucky individuals. Mint: although there are several types of mint that are popular in Vietnam, standard grocery store mint will work just fine in all Vietnamese recipes. Culantro (also called Mexican coriander and saw-tooth herb): this Vietnamese herb is highly aromatic and pungent… almost like cilantro on steroids. Rice Paddy Herb: the small, delicate leaves grow in sturdy pale green stalks and taste of cumin and orange citrus. Rau Ram (also called Vietnamese coriander): similar in taste to cilantro, but peppery and lemony. Thai Basil (also called Asian basil): has purple stems and purple buds. 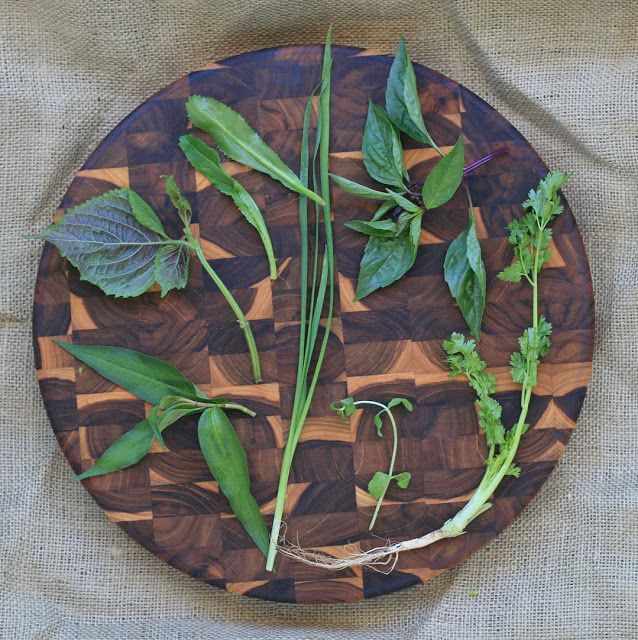 Think of Thai basil as a spicier and less sweet version than the Italian cousin. Vietnamese Balm (also known as Vietnamese mint): this saw-edged, slightly fuzzy herb tastes of lemon and mint. Fish Mint: very appropriately name, this spade-shaped herb has got a very distinctive fishy smell and taste. Water Spinach Curls: not actually an herb at all, but these water spinach curls are a fun addition or garnish for a lot of Vietnamese dishes. They provide texture but not much flavor. You can even purchase a special tool to make them. Lemongrass: a favorite in many dishes, both savory and sweet. Lemongrass tastes and smells, not surprisingly, like lemon. Although it’s started to be sold fresh in many supermarkets, I’ve read that many Asian markets sell frozen, finely ground lemongrass. Green Onions (also called scallions): a very common Asian herb with round, hollow stems and a delicate onion flavor. Garlic Chives (also called Chinese chives): flat leaves with a delicate onion and garlic flavor. Purple Perilla (also called red perilla and shiso): these leaves are green on top and purplish on the underside. They have a subtle taste that I’ve heard described as being reminiscent of cinnamon, licorice, mint and lemon. Any other Vietnamese herbs that I should try?